Jorge Lorenzo took a huge step toward regaining the MotoGP title as he won the San Marino Grand Prix in Misano and rival Dani Pedrosa crashed out. Repsol Honda rider Pedrosa endured a torrid start and was then taken out by Hector Barbera halfway through lap one. That left the way clear for Lorenzo to cruise to victory and extend his championship lead from 13 to 38 points. "We have been saying all season that this championship could come down to who makes the fewest mistakes - and while it wasn't his fault he didn't finish, Pedrosa has been punished in lethal style by Lorenzo." Italy's Valentino Rossi was second in his home race for Ducati, while Briton Cal Crutchlow also crashed out. On a weekend when MotoGP remembered the late Marco Simoncelli at the circuit now named after him, it was fitting that close friend Rossi produced his best ever ride on the Ducati and Alvaro Bautista took third place on the Gresini Honda that should have been ridden by Simoncelli this year. Rossi told BBC Sport: "This second place is something special. I have a lot of fans in Misano, my hometown is only a few minutes away, but more importantly this is in the name of Marco. "This result is for him and for his family. I think Marco helped me to achieve this today." Bautista said: "I am very emotional to get my first podium. I do this in memory of Marco. I dedicate the race to him." The result was a dream scenario for some, but a nightmare for Pedrosa who saw his title hopes suffer a massive blow in a chaotic few minutes. The Spaniard had qualified in pole position but the original start was aborted when Karel Abraham stalled his Ducati on the grid. 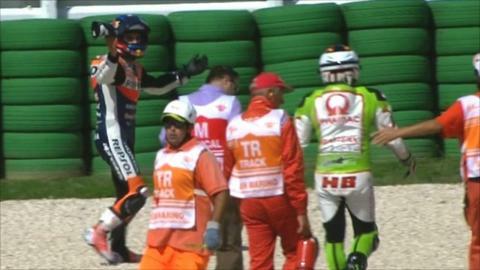 That led to a delay of five minutes or so, during which Pedrosa had a problem with the front wheel of his bike. He was forced to start the race from the back of the grid, and although he made up several places in the first few corners, he was then launched off his bike when Barbera ran into the back of him. Barbera - who has had a season littered with crashes that have seen him break a leg and injure his back - went into the turn too quickly and could not stop, clattering into Pedrosa and sending him off into the gravel. Lorenzo was left with an untroubled run to his sixth win of the season, and a result that almost trebled his championship lead. British rider Crutchlow made a poor start from third on the grid and had been shuffled back to fifth before he crashed out on lap three. Northern Irishman Jonathan Rea, making his MotoGP debut in place of injured world champion Casey Stoner, finished eighth.